1. Sequential injection analysis utilizing amperometric biosensors as detectors for simultaneous determination of L- and D-pipecolic acid. R.I. Stefan-van Staden, R. M. Nejem, J.F. van Staden and H.Y. Aboul-Enein. Instrumentation Science and Technology, 36 (5) (2008) 355 - 368. 2. Determination of (+)-3,3’,5,5’-tetraiodo (L-T4) in serum and in pharmaceutical formulations using a sequential injection analysis/immunosensor system. R.I. Stefan-van Staden, J.F. van Staden, H.Y. Aboul-Enein, M. C. Mirica, I. Balcu and N. Mirica. Journal of Immunoassay and Immunochemistry, 29 (4) (2008) 348 - 355. 1. Enantioanalysis of L-proline using C60 as chiral selectors. Analytical Letters, 42 (2) (2009) 323-329. Analytical Letters, 42 (4) (2009) 758-763. 3. Enantioanalysis of S-Ketoprofen using enantioselective, potentiometric membrane electrodes. R.I. Stefan-van Staden, N. S. Nhlapo, J.F. van Staden and H.Y. Aboul-Enein. Analytical Letters, 42 (5) (2009) 764 - 774. 4. Macrocyclic antibiotics as chiral selectors in the design of enantioselective, potentiometric membrane electrodes for the determination of S-flurbiprofen. R.I. Stefan-van Staden, J.F. van Staden and H.Y. Aboul-Enein. Analytical and Bioanalytical Chemistry, 394 (3) (2009) 821-826. Preparative Biochemistry and Biotechnology, 39 (2) (2009) 142-146. Electroanalysis, 21 (14) (2009) 1651-1654. 7. Enantioselective determination of R-Clenbuterol using an enantioselective, potentiometric membrane electrode based on a β-cyclodextrin derivative. R.I. Stefan-van Staden, L. Holo, B Moeketsi, J.F. van Staden and H.Y. Aboul-Enein. Instrumentation Science and Technology, 37 (2) (2009) 189 - 196. 8. Determination of (S)-(+)-Ibuprofen using enantioselective, potentiometric membrane electrodes based on a Macrocyclic Antibiotics. R.I. Stefan-van Staden, T. Mashile, K. C. Mathabathe and J.F. van Staden. Instrumentation Science and Technology, 37 (2) (2009) 197 - 203. 9. Enantioanalysis of butaclamol using enantioselective, potentiometric electrodes. R.I. Stefan-van Staden, R.G. Bokretsion, J.F. van Staden and H.Y. Aboul-Enein. Analytical Letters, 42 (8) (2009) 1111 - 1118. 10. Maltodextrins as chiral selectors in biomedical enantioanalysis. A minireview. The Open Chem Biomed Meth J , 2 (2009) 107-110. 1. Application of porphyrins in flow-injection analysis. A Review. J.F. van Staden and R.I. Stefan-van Staden. Talanta, 80 (5) (2010) 1598 – 1605. 2. Enantioanalysis of S-deprenyl based on its interaction with C60 fullerene derivatives. Electrochimica Acta, 55 (5) (2010) 1772 - 1777. 3. Enantioanalysis of S-Ibuprofen using [5-6] Fullerene-C70 and diethyl (1,2-methanofullerene C70)-71-71-dicarboxylate. Analytical Methods, 2 (1) (2010) 37 – 40. 4. Diamond paste based electrodes for the determination of sildenafil citrate (viagra). 5. Enantioanalysis of R-deprenyl based on its molecular interaction with C70 fullerenes. 6. Determination of free L-T4 and free L-T3 from blood using the immunosensors/sequential injection analysis system. Analytical Letters, 43 (7-8) (2010) 1119 – 1125. 7. Micro- and nanosensors. Recent developments and features. A minireview. Analytical Letters, 43 (7-8) (2010) 1111 - 1118. 8. Simultaneous determination of L- and D-T4 using a sequential injection analysis/sensors system. Combinatorial Chemistry & High Throughput Screening, 13 (6) (2010) 497 - 501. 9. Enantioanalysis of (-)butaclamol using vancomycin and teicoplanin as chiral selectors. R.I. Stefan-van Staden, N.S. Nhlapo, J.F. van Staden, H.Y. Aboul-Enein. Combinatorial Chemistry & High Throughput Screening, 13 (8) (2010) 690 – 693. 10. Wireless electrochemical sensors. A tool for process control. The past, present and the future. A mini-review. J.F. van Staden, R.I. Stefan-van Staden, S.C. Balasoiu. Critical Reviews in Analytical Chemistry, 40 (4) (2010) 226 -233..
11. Enantioanalysis of D-histidine based on its interaction with [5-6] fullerene-C70 and diethyl (1,2-methanofullerene C70)-71-71-dicarboxylate. New Journal of Chemistry, 34 (6) (2010) 1141 – 1147. 12. Diamond paste based electrodes for the determination of Ag(I). R.I. Stefan-van Staden, S. G. Bairu and J. F. van Staden. Analytical Methods, 2 (6) (2010) 250 - 252. 13. Carbon and diamond paste microelectrodes based on Mn(III) porphyrins for the determination of dopamine. S. C. Balasoiu, R.I. Stefan-van Staden, J. F. van Staden, S. Pruneanu and G. L. Radu. Analytica Chimica Acta, 668 (2) (2010) 201 - 207. Current Pharmaceutical Analysis, 7 (4) (2011) 253-257.
applications for enantioanalysis of L-Cysteine in urine. Current Pharmaceutical Analysis, 7 (4) (2011) 258-261. 4. Disposable stochastic dot sensors for the assay of ascorbic acid in pharmaceutical samples, beverages and biological fluids. Analytical Letters, 43 (13) (2011) 2280-2286. 5. Amperometric dot-sensors based on Zinc porphyrins for the Sildenafil citrate determination. Electrochimica Acta, 58 (1) (2011) 290-295. 6. Enantioselective, potentiometric membrane electrodes based on antibiotics for the determination of L- and D-glyceric acids. International Journal of Electrochemistry, Volume 2011, Article ID427238, 4pg,doi:10.4061/2011/427238. 282. Determination of L- and D-Fucose Using Amperometric Electrodes Based on Diamond Paste. Analyst, 137(4) (2012) 903 - 909. 283. Amperometric biosensor based on diamond paste for the enantioanalysis of l-lysine. Biosensors and Bioelectronics, 35(2) (2012) 439-442. 284. Microelectrodes based on porphyrins for the determination of ascorbic acid in pharmaceutical samples and beverages. R.I. Stefan-van Staden, S.C. Balasoiu, J.F. van Staden and G.L. Radu. Journal of Porphyrins and Phthalocyanines, 16(7-8), (2012), 809-816.
dopamine as neurotransmitter. A review. 286. Electroanalysis of oseltamivir phosphate using new microelectrodes based on zinc complexes with porphyrins and phthalocyanines. Journal of the Electrochemical Society, 159(9), (2012), B789-B793. Journal of the Electrochemical Society, 160(10) (2013) B192-B195. 290. Quinine, quinidine and their tert-butyl carbomylated derivatives as new chiral selectors in the potentiometric, enantioselective membrane electrodes design. Journal of the Electrochemical Society, 160(10) (2013) B196-B200. 291. Theoretical considerations regarding the aromaticity of ∆3-heterobenzenes containing 15-group elements. Digest Journal of Nanomaterials and Biostructures, 8(4) (2013) 2207-2218. Journal of Modern Medicinal Chemistry, 1(2) (2013) 86-91. Revue Roumaine de Chimie, 58(7-8) (2013) 659-665. Journal of the Electrochemical Society, 161(2), (2014), B3014-B3022. Current Pharmaceutical Analysis, 10(1) (2014) 20-29. 296. Influence of sulfate and nitrate uptake from aqueous solutions on surface exchange in Purolite A-520E resin. Comptes Rendus Chimie, 17(7-8) (2014) 738-745. Journal of the Electrochemical Society, 161(4), (2014), B49-B54. Journal of Neuroscience Methods, 229, (2014) 1-7. Journal of the Electrochemical Society, 161(9), (2014) B167-B170. Sensing and Biosensing Research, 1, (2014) 1-7. RSC Advances, 4(50), (2014) 26383-26388. Critical Reviews in Analytical Chemistry, 45(1) (2015) 2-31. Revue Roumaine de Chimie, 60(5-6) (2015) 447-451. 304. Design of potentiometric sensors based on Interaction of cyclodextrins with the enantiomer of interest. Current Drug Therapy, 9(4), (2015) 250-255. Revue Roumaine de Chimie, 60(5-6) (2015) 461-466. Journal of Porphyrins and Phthalocyanines, 19(5) (2015) 679-687. R. Georgescu, J.F. van Staden. Revue Roumaine de Chimie, 60(5-6) (2015) 563-569. 309. Analytical continuous flow systems. Where two worlds collide! From gravimetry and test tubes to flow systems to FIA to SIA to PAT and from Orsat to control room to PAT to TAP. Revue Roumaine de Chimie, 60(5-6) (2015) 403-414. Raluca Pop, Jacobus van Staden, Mircea Diudea. Journal of the Electrochemical Society, 162(14), (2015) B360-B362. 314. Stochastic sensors based on maltodextrins for screening of whole blood for neuron specific enolase, carcinoembryonic antigen and epidermal growth factor receptor. Mycrosystem Technologies, 22(1) (2016) 25-29. Analytical Letters, 49(2) (2016) 335-341. Raluca Pop; Mihai Medeleanu; Jacobus Frederick van Staden; Mircea Diudea,. Zeitschrift für Physikalische Chemie, 230(2) (2016) 285-296. Analytical Letters, 49(17) (2016) 2783-2792. U.P.B. Sci. Bull., Series B, 79(2) (2017) 113-120. 319. Nanostructured Materials Detect Dopamine in Biological Fluids. Journal of The Electrochemical Society, 164(9) (2017) B443-B447. 321. Determination of Tryptophan in Pharmaceutical Formulations using a Sequential Injection - Zone Fluidic - Chemiluminescence Tubular Reactor. Analytical Letters, 51(6) (2018) 849-859. Microchemical Journal, 137 (2018) 418-421. 1. Fullerenes – New Chiral selectors for enantioanalysis. International Conference on Chemistry and Chemical Engineering. Romanian Chemical Society, Politehnica University of Timisoara, Timisoara, Romania. 28 – 30 May 2008. 2. PATLAB. From test tube to Process Systems. The road ahead. 3. The importance and essentiality of real-time intelligent interactive monitoring and control in medical, pharmaceutical and clinical fields with PAT. J.F. van Staden, R.I. Stefan-van Staden and I. Balcu. 3rd International Conference on Biomaterials and Medical Devices, BIOMMEDD’2008, Romanian and European Society for Biomaterials, Politehnica University of Bucharest, Romania. 13 – 16 November 2008. 4. New nanostructured materials based on porphyrins for the design of stochastic sensors. R.I. Stefan-van Staden, E. Fagadar-Cosma, J.F. van Staden, O. Radacina and S. Balasoiu. E. Fagadar-Cosma, C. Enache, D. Vlascici, Gh. Fagadar-Cosma, R.I. Stefan-van Staden, H. Stadler, J.F. van Staden. Nanotech Insight, 29th March – 2nd April 2009, Barcelona, Spain. 2. Determination of free-L-T3 and free-L-T4 from blood using the immunosensors/sequential injection analysis system. Journées d’Electrochimie XIV-ème édition, 6 - 10 July 2009, Sinaia, Romania. 3. Flow- or Non Flow-based, Unit operations, Micro- or/and Nanosensors: "Microfluidics", Real-time: Is a marriage with PAT always possible? The Reality and the Future. 6 - 10 September 2009. 4. New stochastic microsensors based on nanostructured materials for molecular diagnosis. IMA’2009. The 6th International Conference of Instrumental Methods of Analysis. Modern Trends and Applications. Athens, Greece, 4 - 8 October 2009. Modern Analytical Methods 2009 (dedicated to the 50th Anniversary of Nobel Prize in Polarography, J Heyrowsky). Prague, Czech Republic. 9 - 13 December 2009. 1. Porphyrins as new nanostructured materials for the design of stochastic sensors. R.I. Stefan-van Staden, E. Fagadar-Cosma, O. Radacina, J.F. van Staden, S. Balasoiu, I. Balcu, M. Iorga. Euroanalysis XV, Division of Analytical Chemistry (DAC) of the European Association of Chemical and Molecular Sciences (EuCheMS) and the Austrian Society for Analytical Chemistry (ASAC), Innsbruck, Austria, 6 - 10 September 2009. TNT 2009. 7-11 September, 2009 , Barcelona, Spain. 1. The Importance and essentiality of interactive real-time intelligent monitoring and control in food processing and distribution with PAT with food processing and distribution. Challenges in Food Chemistry, Workshop, 28th May – 29th May 2010, Constanta, Romania. 2. Stochastic sensors - a new tool for Food Analysis. 3. Stochastic Microsensors for Molecular Diagnosis. IMCS’13, 13th International Meeting on Chemical Sensors, 11 – 14 July 2010, Perth, Australia. AUTOMATED REAL-TIME INTERACTIVE MICRO INFORMATION MANAGEMENT AND PROCESS CONTROL ON-SITE SYSTEMS. Prof Dr J. F. (Koos) van Staden. CMEQF 01-2010, Control and Metrology of Environmental Quality Factors, 23 – 27 November 2010, Iasi, Romania. 1. DOT Sensors – New Tools for Biomedical Analysis. J. F. van Staden and R.I. Stefan-van Staden. 2. Carbon and Diamond Paste Microelectrodes based on Mn(III) Porphyrins for the Determination of Dopamine. J.F. van Staden, R.I. Stefan-van Staden, S.C. Balasoiu, and G.L. Radu. Diaspora Conference, 22nd – 24th September 2010, Bucharest, Romania. 4. Diamond Paste based electrochemical (Bio)sensors. 5. COMBINED DOT SENSORS FOR FOOD ANALYSIS. J. F. van Staden and R. I. van Staden. AACD 2010, 7th Aegean Analytical Chemistry Days, 29th September – 3rd October 2010, Lesvos, Greece. 6. MINICELLS FOR BIOMEDICAL INVESTIGATIONS. R. I. van Staden and J. F. van Staden. 1. Modified Carbon Paste Electrodes based on Porphyrin for the Enantioanalysis of S-Captopril. S. Balasoiu, R.I. van Staden, J.F. van Staden and G. L. Radu. Nanomeasures2010, 3rd – 4th June 2010, Krakow, Poland. 1. Nanotechnology and flow systems. 1. Nanotechnology in the flow domain of Process Analysis. J.F. van Staden, R.I. van Staden. Euroanalysis XVI, Division of Analytical Chemistry (DAC) of the European Association of Chemical and Molecular Sciences (EuCheMS) and the Austrian Society for Analytical Chemistry (ASAC), Belgrade, Serbia, 11 - 15 September 2011. 1. Enantioanalysis of Pipecolic acid with stochastic and potentiometric microsensors. RI Stefan-van Staden, I Moldoveanu, DF Sava, C Kapnissi-Christodoulou, JF van Staden. (EuCheMS) and the Austrian Society for Analytical Chemistry (ASAC), Belgrade, Serbia, 11 - 15 September 2011. 2. Amperometric Dot-sensors Based on Zinc Porphyrins for Sildenafil Citrate Determination. 1. Amperometric Dot-sensors Based on Zinc Porphyrins for Sildenafil Citrate Determination. IMCS’14, 14th International Meeting on Chemical Sensors, 20-23 May 2012, Nuremberg,Germany. 387. Amperometric Dot-Sensors based on Zinc Porphyrins for the Determination of Sildenafil Citrate. ICS 2012 The 14th International Meeting on Chemical Sensors, May 20 –23, 2012 Nuremberg, Germany (Oral presentation). 388. New Stochastic Sensors for Biomedical Applications. R. I. van Staden, I. Moldoveanu, J. F. van Staden. IMCS 2012 The 14th International Meeting on Chemical Sensors, May 20 – 23, 2012 Nuremberg, Germany (Oral presentation). 390. Nanotechnology and Multianalyte Platform Flow Systems. 4th EuCheMS Chemistry Congress (EuCheMS 2012) 26-30 August 2012, Prague, Czech Republic (Oral presentation). 391. Simultaneous neurotransmitters analysis using microelectrodes based on porphyrins. 392. Nanotechnology in the Flow Domain of Process Analysis. 18 - 21, 2012 (Invited Key note). 393. Influence of the physical immobilization of dsDNA on the carbon based matrices of electrochemical sensors. 394. New amperometric microsensors for the analysis of serotonin in urine samples. J. F. van Staden, R. Georgescu, R. I. van Staden. 223rd ECS Meeting, May 12-16, 2013, Toronto, Canada (Oral presentation). 397. Combined DOT sensors for food, pharmaceutical and biological analysis. J. F. van Staden, R. I. van Staden. 398. Stochastic Sensors – New Tools for the Screening for Obesity. R. I. van Staden, L. A. Gugoasa, J. F. van Staden. 399. Graphene Based Microsensors for the Assay of Adenine, Guanine and Epinephrine. J. F. van Staden, R. Georgescu. 224th Meeting of ECS, 27 October – 1 November, 2013, San Francisco, CA, USA (Invited keynote). 401. Graphene based dot microsensors for the assay of adenine, guanine and epinephrine. J.F. van Staden, R. Georgescu and R.I. Stefan-van Staden. 402. Combined dot sensors for food, pharmaceutical and biological analysis. J.F. van Staden and R.I. van Staden. 403. Combined dot sensors in the domain of food, pharmaceutical and biological areas. 404. The Potential of Sensors and Biosensors for Integrated Process Control in Real-Time. Can They Survive the Environment? 405. Coated Tubular Ion-Selective Electrode Units in Process Systems. 406. Can Sensors and Biosensors Survive the Demand of Factories of the Future for Process Control in Real-Time? t o SIA to PAT and from Orsat to control room to PAT to TAP. 411. Detection of folic acid from orange juice using amperometric dot microsensors based on graphite modified with tetraamino and tetranitro phthalocyanines. R. Georgescu, J.F. van Staden, R.I. Stefan-van Staden, C. Boscornea. 412. Porphyrin based stochastic microsensors for the assay of dopamine, epinephrine, norepinephrine, serotonine, acetylcholine, gaba and glutamate. I. Moldoveanu, R.I. Stefan-van Staden, J.F. van Staden. 413. Platform based on microsensors used for the screening of her-1 in peritoneal fluid. I. Moldoveanu, R.I. Stefan-van Staden, J.F. van Staden, C. Stanciu-Gavan, C. Savlovschi. 414. Amperometric dot microsensors based on graphite and graphene modified with porphyrins for the analysis of folic acid from pharmaceutical tablets. R. Georgescu, J.F. van Staden, R.I. Stefan-van Staden, I. Calinescu. 415. Stochastic microsensors as screening tools for neuron specific enolase. I.R. Comnea, R.I. Stefan-van Staden, J.F. van Staden, C. Stanciu-Gavan. 416. Stochastic Sensors Based on Diamond Paste for Screening of Biological Fluids for Neurotransmitters. R.I. Stefan-van Staden, I. Moldoveanu, J.F. van Staden. 227th ECS Meeting, 24-28 May 2015, Chicago, IL, USA. 418. The Potential of Sensor Platforms for Dynamic Integrated Process Control in Real-Time. Are they Suitable to Function Properly in the Environment? IC-ANMBES 2016, International Conference on Analytical and Nanoanalytical Methods for Biomedical and Environmental Sciences– June 29-July 1, 2016, Brasov, Romania. 419. SENSOR (DETECTION) DEVICES AND PROCESS CONTROLLERS IN INTEGRATED REAL-TIME PROCESS CONTROL. DO THEY FULLFIL THE ACTUAL REAL-TIME ON-SITE? 421. DETERMINATION OF DOPAMINE USING THE ALKALINE LUMINOL-HYDROGEN PEROXIDE SYSTEM FOR SEQUENTIAL INJECTION – ZONE FLUIDICS ANALYSIS. 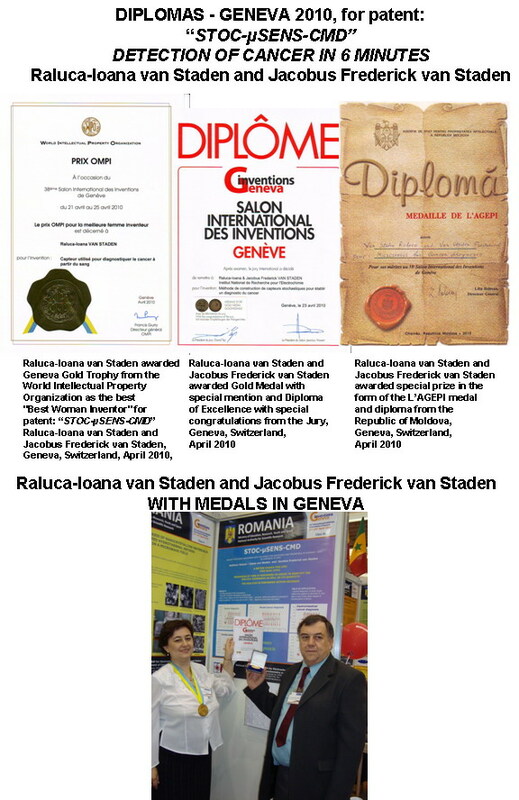 Ramona GEORGESCU-STATE, Jacobus Frederick van STADEN. 422. Reliable, sustainable, sufficient and convenient devices and/or systems for real-time interactive monitoring and control. 41st ARA, Congress of the American Romanian Academy of Arts and Sciences, 2-5 August 2017, PALACE, Sinaia. Romania. Ioana-Georgiana Lazar, Raluca-Ioana Stefan-van Staden, Livia Alexandra Gugoasa, Jacobus Frederick van Staden. EARLY DETECTION OF CANCER –TIME IS LIFE. Congress of the Researchers and Inventors from Romania, 11 - 12 December 2008, Bucharest, Romania. on 29 October 2009 in Bucharest, Romania organized by the Foundation Dinu Patriciu. nr D1 1055/2007)) for a patent on stochastic sensors at the Pro Invent, 24 - 27 March 2009, Cluj-Napoca, Romania. at molecular level, before the patient is clinically ill, at Inventika, 28 - 31 October 2009, Bucharest, Romania. 1-5 April 2009, Geneve, Switzerland. Contract nr D1 1055/2007)) for a patent on stochastic sensors at the International Warsaw Invention Show, IWIS 2009, 1-3 June 2009, Warsaw, Poland. 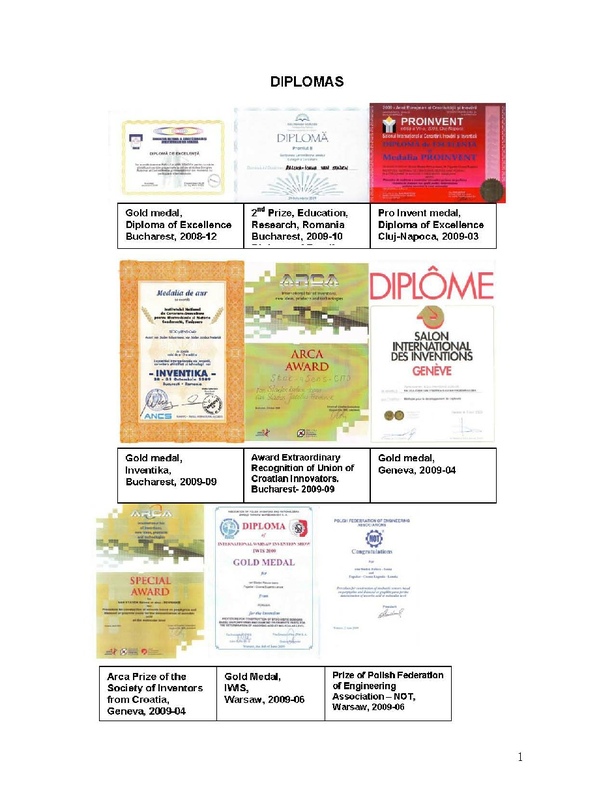 of Innovations and Investments, 26 - 29 August 2009, Moscow, Russian Federation. at EUREKA 2009, 19-21 November 2009, Brussels, Belgium. 16-19 March 2010, Cluj-Napoca, Romania. Inventions des Techniques et Produit Nouveaux, 20-25 April 2010, Geneve, Switzerland. 38eme Salon International des Inventions des Techniques et Produit Nouveaux, 20-25 April 2010, Geneve, Switzerland. PATLAB also fulfil its mission with a steadily increase in the number of young researchers/post graduate students and currently the people (researchers) actively involved in the research teams of PATLAB including the young researchers/post graduates increased to a total of 25 including 9 young researchers with PhD-qualifications, 2 Post Doc students; and 11 students that are busy with research for PhD and 2 MSc-students at PATLAB from the POLITEHNICA University of Bucharest and from the “Politehnica” University of Timisoara. We also have an active role in the international scientific community with J. (Koos) F. van Staden serving on the International Advisory Board of Analytical Letters and Journal of Flow Injection Analysis and R. (Raluca) I. van Staden on the International Advisory Board of Preparative Biochemistry and Biotechnology, Sensor Letters and Sensors & Transducers Journal. Both of us are also in a constant process of receiving and refereeing manuscripts from various international journals. J. (Koos) F. van Staden serves on the Steering and Scientific Committees of International Meetings. Both Koos and Raluca van Staden is active members of the Division of Analytical Chemistry (DAC) of the European Association of Chemical and Molecular Sciences (EuCheMS) and both are also members of the European Association of Chemical and Molecular Sciences (EuCheMS), of The Electrochemical Society (ECS) and of the American Chemical Society (ACS). Raluca van Staden is the Chair of Romanian International Chapter of ACS in Romania. Professor Dr. Jacobus Frederick van Staden, Professor Emeritus of the University of Pretoria, South Africa and Director of PATLAB, Bucharest, Romania was the Honorary President and Prof Dr Eng. Radu Munteanu, Rector of the Technical University of Cluj-Napoca, Romania the President of the Jury on the occasion of the eighth edition of the International Exhibition of Research, Innovation and Inventions, “PRO INVENT 2010”, organized by the Technical University in collaboration with the Chamber of Commerce and Industry of Romania and the Union Society of Inventors Universities in Cluj, between 16-19 March 2010 in Cluj-Napoca, Romania. Prof Koos van Staden was involved in various projects with various process industries for example with SASOL, pharmaceutical companies, Be Beers, Element 6, Anglo American, Amplats, MINTEK, National Water Research Commission etc in RSA and international where he developed expertise with involvement in Process Intensification, Chemical, Electrochemical and Optical Sensors, Catalysis, Process Technologies, Catalytic Membrane (Bio)Reactors, Automotive Battery Research etc. and he served as Project Technical Advisor in 13 projects for the European Commission since 2009 up to 2016 where he was also involved as rapporteur, independent observer, evaluator and as technical scientific reviewer. During this period he also becomes an active member of SUSCHEM from the European Commission. 3. Analytical Sensor Electrochemical and Photonic Platforms for fast interactive control. THE PRICE OF THE SERVICE WILL BE ESTABLISHED ACCORDINGLY WITH THE SAMPLE AND/OR THE METHOD USED. 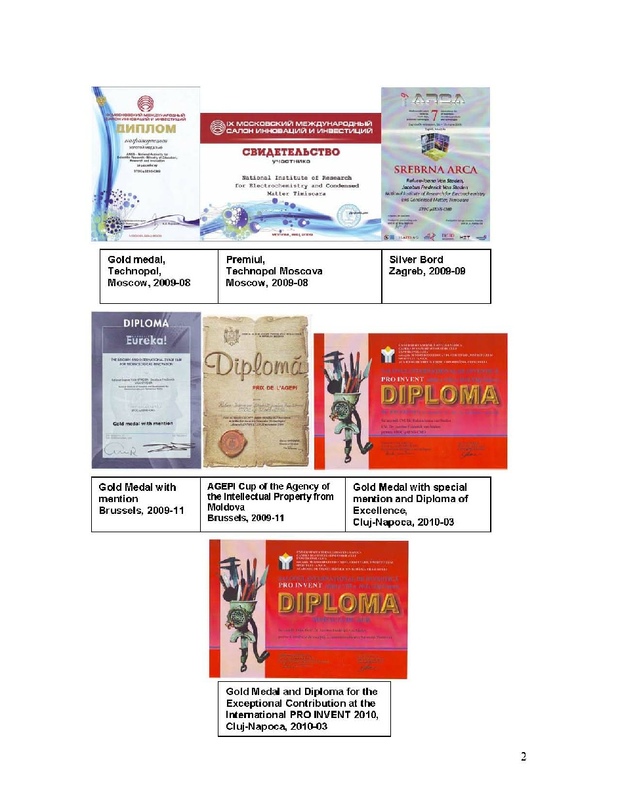 The following is the current flyer distributed by PATLAB. ESTABLISHMENT OF A LABORATORY OF PROCESS ANALYTICAL TECHNOLOGY. ESTABLISHMENT OF A LABORATORY OF PROCESS ANALYTICAL TECHNOLOGY. EXTENSION1. Process Analytical Technology (PAT) is the application of Analytical Science in its broadest sense to monitor and control any activity also called operating systems (or processes) as a global entity (in totality) in real-time. 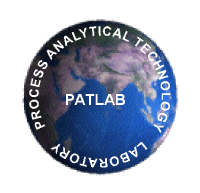 Micro Process Analytical Technology (MPAT) implies the study and application of PAT with all the available sources and modern microsystems technology. Nano Process Analytical Technology (NPAT) implies the study and application of PAT with all the available sources and modern technology on a nano- and even atomic scale. VISION:- The primary vision is to use PATLAB as a basis and source to supply the necessary skills and education with high quality research and innovation to serve as a catalyst for cost effective dynamic actively driven industries to improve the quality of life and wealth in a sustainable environment. MISSION: Research and development in flow-based and non-flow-based systems using PAT and NPAT to create smart intelligent interactive process equipment with highly intelligent interactive built in monitoring and PID control devices to ensure either single-point or multi-point multi-species real-time measurements. STRATEGY: The strategy of PATLAB, aligned to the national strategy of the R-D-I domain, is to integrate successfully with high level advanced competitive modern instrumentation for research-development as a research laboratory of excellent international status and competence into the new European and national research networks. This should be done in co-operation formed by institutes, universities and economic agents for approach of technological and scientific development programs, that will lead to a social and economical development of our country. should feel welcome to use PATLAB with well-equipped facilities as base for their studies to become so well-trained that their expertise should be wanted where-ever they wanted to go, be able to become entrepreneurs to enhance economical development of production and research human potential. Domain 7. Materials, processes and Innovative Production. ESTABLISHMENT OF A LABORATORY OF PROCESS ANALYTICAL TECHNOLOGY. PATLAB. Domain 10. Chemical and Process Engineering. DOT SENSORS. A NEW CONCEPT IN SENSORS TECHNOLOGY. 1. FLOPRO-FLOW PROCESS RESEARCH ANALYZER. 2. MINI-FLOPRO-ZONE FLUIDICS RESEARCH PROCESS ANALYZER WITH UV/Vis DETECTION. Mini-FloPro equipped with milliGAT pump, 2 selection valves, heated reactor and plumbed for zone fluidics equipped to study a variety of chemistries. Ocean Optics multi wavelength spectrometer for UV/vis detection. Laptop PC and process development software. Mini-FloPro equipped with milliGAT pump, 2 selection valves, heated reactor and plumbed for zone fluidics equipped to study a variety of chemistries. Bioanalytical Petit Ampere potentiostat for amperometric detection. Laptop PC and process development software. Mini-FloPro equipped with milliGAT pump, 2 selection valves, heated reactor and plumbed for zone fluidics equipped to study a variety of chemistries. Ocean Optics detector for fluorescence detection. Laptop PC and process development software. Mini-FloPro equipped with milliGAT pump, 2 selection valves, heated reactor and plumbed for zone fluidics equipped to study a variety of chemistries. Global FIA FireFly detector for chemiluminescence detection. Laptop PC and process development software. 6. QE65000 SCIENTIFIC-GRADE SPECTROMETER FOR FLUORESCENCE DETECTION. QE65000 Scientific-grade Spectrometer, fluorescence setup, PX-2 Pulsed Xenon Lamp as an excitation source, Hamamatsu FFT-CCD detector, detector range 200-1100 nm, Full scans to memory every 7 ms with USB 2.0 port as data transfer rate, Quantum Efficiency to 90%, Optical Fiber Bundles, Computer and software. HR4000 high-resolution spectrometer, UV/Vis through Shortwave NIR setup, Balanced Deuterium Tungsten Source, 3648-element CCD-array detector from Toshiba that enables optical resolution as precise as 0.02 nm (FWHM), detector range 200-1100 nm, Full scans to memory every 4 ms with USB 2.0 port as data transfer rate, Optical Fiber Bundles, Computer and software. All units suitable for Cyclic and linear voltammetry, Square wave voltammetry, Normal and differential pulse voltammetry Chronoamperometry and chronopotentiometry with micro- and nanosensors, able to bundle up to 5 working electrodes-multiplexed. Agilent 5500 ideal multiple-user research system for atomic force microscopy (AFM) and scanning probe microscopy (SPM) with electrochemical scanning microprobe microscopy (EC-SPM) to study the behaviour and kinetics of electrochemical micro- and nanoprobes in real time, Pico-TREC for simultaneous topography and recognition imaging with SPM for mapping target molecules on a sampling surface ideally suited for nanoelectrode sensor structuring and modifying, lithography and nanomanipulation with micro machining through force variations, nano patterning via probe bias and electrochemical etching, nano writing and nano modification via surface potential controlled deposition. High-resolution research spectrometer Wavelength range 185 – 3300 nm, Equipped with 3 detectors: a PMT detector (photomultiplier tube) for the ultraviolet and visible regions, and InGaAs and PbS detectors for near infrared region. InGaAs detector bridges the gap between the PMT - PbS switching wavelength where sensitivity is typically low to ensure high sensitivity over the entire measurement wavelength range with <0.00003 Abs noise at 1500 nm. 11. CYBERSCAN PCD 6500 pH/ION/CONDUCTIVITY/DO MULTIMETER. Cyberscan PCD 6500 pH/Ion/Conductivity/Dissolved Oxygen multimeter measures and views up to four parameters at the same time with no cross-channel reference. A CE-Driven Full-Colour Touchscreen 21 CFR Part 11-compliant Bench meter with real-time on-screen multichannel, single channel or graphical analysis functions to give quick, convenient analysis of data with advanced, extensive communication capabilities with USB. 12. AUTOLAB ESPRIT SURFACE PLASMA RESONANCE INSTRUMENT. The Autolab Surface Plasma Resonance (SPR) instrumentation helps the scientist to analyze bi-molecular interactions in real time, without labeling requirements. The Autolab ESPRIT allows the user to perform high-througput SPR experiments using a fully automated system including a reference channel for temperature and non-specific binding compensation. The Autolab Esprit is a unique double channel Surface Plasma Resonance (SPR) instrument with an autosampler incorporated with a normal standard cuvette for all Surface Plasma Resonance (SPR) measurements where biomolecular interactions are studied and a normal cuvette is standard supplied for all SPR measurements where biomolecular interactions are studied. The optional electrochemical cuvette allows measurements on a 3-electrode system: a fixed contact point to the gold layer of the sensor disk, the gold operates as working electrode, replaceable Ag/AgCl reference electrode and a fixed Platinum counter electrode. 13. SECM370 SCANNING ELECTROCHEMICAL MICROSCOPE SYSTEM. The SECM370 is a precision scanning micro-electrode system, which can be used to monitor (or impose) current flowing between a micro-electrode and a specimen surface in solution at extremely high spatial resolutions. It can be used to examine, analyse or alter the surface chemistry of a sample in solution. This equipment has many potential applications in the study of fundamentals of surface reactions for example in flow through membranes, chemical imaging of biosystems, corrosion science, or the study of enzyme stabilization. The SECM370 system includes a precision dual potentiostat system, allowing full control and measurement of electrochemical processes at the micro-electrode tip and substrate independently. The QEPRO-Raman Scientific-grade Spectrometer is a preconfigured combination of detector, optical bench, electronics, probe and laser technologies that provide users with a remarkably sensitive system for demanding low-light level Raman spectroscopy. The QE65000-Raman can achieve up to 90% quantum efficiency with high signal-to-noise and rapid signal processing speed. PATLAB is equipped with a PinPointer instrument that packs a full-featured Raman system in a true hand-held unit. This is the next generation of the portable Raman spectrometer that was featured in an episode of CSI Miami and a cave exploring documentary by NASA scientists on the National Geographic Channel. The unit is controlled by a miniature Windows computer and features easy-to-use ID-find™ software that provides one-touch identification of unknown substances by immediate comparison of a measured spectrum to the on-board Raman spectral library. PATLAB has a SUPER-FAST OCEAN FX SPECTROMETER with High Sensitivity, Fast Acquisition Speed and Enhanced Communications. The Ocean FX is a versatile spectrometer distinguished by acquisition speed up to 4,500 scans per second, onboard processing for improved SNR and reduced data transfer time, and robust communications via USB, SPI, Gigabit Ethernet and Wi-Fi. Ocean FX is an excellent choice for high-speed process applications, measurement of fast events, and reaction monitoring.